I find Eremophila splendens to be a spectacular plant when in flower. 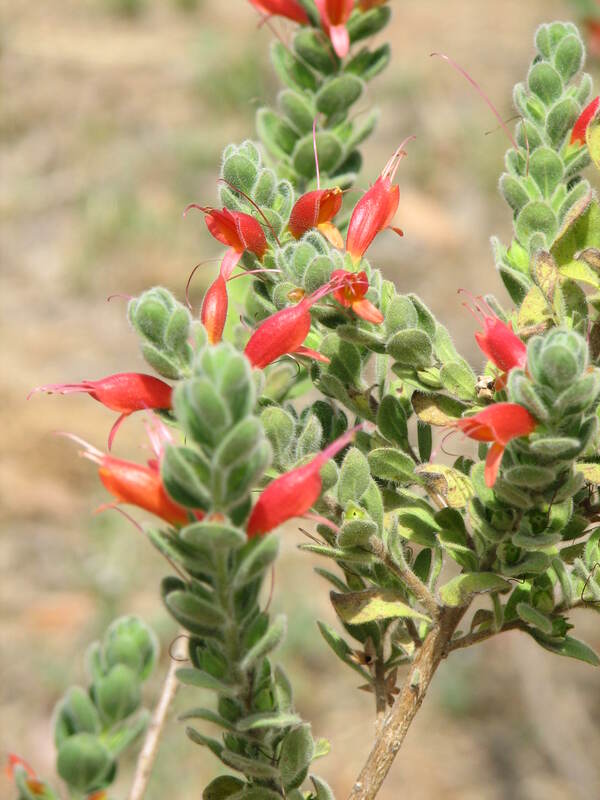 The bright red flowers glow against the foliage which is quite hairy similar to some Eremophila glabra forms. This plant needs very good drainage. It is either a sprawling low plant or can be quite upright. Eremophila splendens is restricted to Shark Bay about midway along the Western coast of Western Australia. It grows on the heathlands with Thryptomene and Melaleuca. Last winter I lost some small plants to frost but I want to try again in a more sheltered location where the canopy of mallees may protect them. This is a plant that needs to be pruned aftyer flowering to encourage new and dense growth. Mature plants get very leggy and have sparse foliage without the pruning. Some Paper Daisies (Everlasting Daisies) have begun to germinate. These are Rhodanthe chlorocephala, sub species rosea. It is always an exciting event when I see the first green shoots that signal germinating seeds. I also noticed the first shoots of Anigozanthos humilis (Cat’s Paw), one of the Kangaroo Paw family. I can’t let myself get excited yet. Germinating is one thing. Getting them to grow on is another matter. That is when you will hear the cheering. A friend’s mum had a wonderful yellow form of Anigozanthos flavidus from which I collected seed. That is always a reliable plant to propagate, and quite hardy in this area. The flower stalks are often over two metres tall. They look good planted in groups. They should be showing in the seed pots soon. My great desire at the moment is to be able to germinate Anigozanthos rufus (Red Kangaroo Paw). I fell in love with this plant when I saw it growing on the side of the road near Esperence in Western Australia. These are plants that are popular at the Australian Plants Society Plant Sale in Adelaide. The next sale is this Saturday and Sunday 29th and 30th April 2006. There is another sale at Geranium the following Sunday, 7th May.